Washington (CNN) - Congress itself is now having so much trouble signing up for the Obamacare exchanges that late Friday the top administrator in the House of Representatives laid out a backup plan in case lawmakers and staff can't get through the process by the time their enrollment ends Monday. 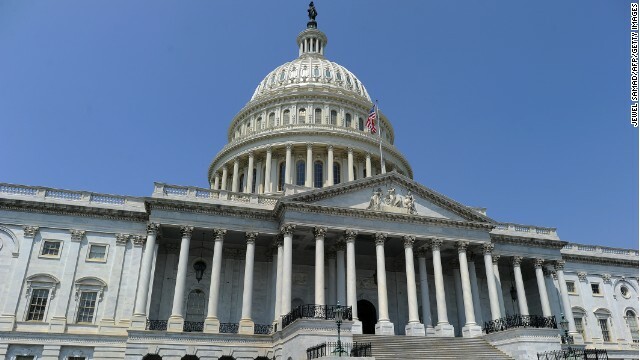 The red flags started reaching critical mass Thursday and Friday, when some staff and members of Congress told House administrators they were having trouble enrolling through the Washington health exchange, known as DC Health Link. The D.C. exchange is the official signup portal for Congress, where members must go to get health care through their job. Thursday night the chief administrative officer of the House sent an e-mail, obtained by CNN, to thousands of Congressional staffers bluntly describing a problem. "We have made the Office of Personnel Management (OPM) and DC Health Link aware of the significant problems preventing Members and staff... from enrolling in a healthcare plan via the DC Health Link website," Dan Strodel wrote. But the spokesman for DC Health Link, Richard Sorian, disputed that anyone has been blocked from enrollment. "We have not had any capacity problems," he told CNN. Sorian said that volume has increased as Congress nears the Dec. 9 deadline for its enrollment. So far, Sorian says, one-third of all Congressional members and workers who are designated to go on the exchange have enrolled. About half have filled out applications and started looking at plans. That leaves a large group that has not enrolled yet and could mean a rush of people signing up Monday, though Sorian notes that many eligible staffers may be getting healthcare elsewhere, such as through a spouse's plan. Among those who still need to enroll are many members of Congress. "I tried to get on the exchange, so did my staff, but none of us could," House Appropriations Chairman Hal Rogers, R-Kentucky, told CNN. "I tried to get on the website for over an hour," echoed Rep. Randy Weber, R-Texas. The reports of problems led to an unusual step by Strodel – setting up a backup plan. He sent an e-mail Friday night to all members and staff designated to go onto the exchanges. The e-mail, also obtained by CNN, stipulates that anyone who tries to get through the D.C. exchange but can't enroll by the end of the day Monday will have an additional week to contact his office and sign up. In addition, Strodel took the unusual step of opening up House payroll and benefits offices this weekend so that staffers and members could come in person to see if their enrollment has been confirmed by the DC Health Link. While many offices expressed frustration with signup at the end of the week, a large number of staffers also insisted that the process worked smoothly for them. Sabrina Singh, an aide to Rep. Jan Schakowsky, D-Illinois, told CNN that she enrolled in the D.C. exchange in 15 minutes Thursday. As has been the case across the Obamacare exchanges, it could have been a problem of peak usage overwhelming the system. "I know some people were frustrated, but I went later in the day and enrolled with no problem," Singh said. Singh admitted that other staffers had trouble getting on the site. The mixed experience will end Monday one way or the other. The DC Health Link will only allow congressional staffers to sign up until then. After that, anyone who couldn't enroll in a plan will have to go to the backup plan. I love that libs are losing their minds because of obamacare.sane democrats will start shunning lib philosophy just like all intelligent people do. Many of them are the same clowns who want to know whether George Obama stayed with a relative some twenty years ago. Next they'll wanna know who he shacked up with and the positions they did it in without telling about themselves. Part of the Democratic brand now: they own it lock stock and barrel! I guess it's only the republic staffers having a problem to apply on the system. Now the system will be accused of being partisan; stupidity and illiteracy of the republican and the 1% of the population. Have you noticed how the media has the same mentality as the RepubliCONS and the Teabaggers, always negative about the ACA. I guess the Democrats should have acted like 2 years olds when Medicare D was being implemented by the RepubliCONS had a mess on their hands, but no the Democrats unlike the Teapublicans help get the program implemented. Our RepubliCON and Teabag Party's have a lot of hatred in them against our black President, the poor, the middle class, the elderly and yes our Veterans. They are lower then a snakes belly. The only way to kill a snake is to cut their heads off, and we can do that when we VOTE them out of politics and onto the unemployment lines, in 2014 and 2016...They are worthless!!!!!!!!!! Surprise, surprise now the GOP is supposedly having problems signing up for the ACA. Not to worry after they come back from their long holiday after having not worked for the whole year, they'll convene another investigation & hearing to get to the bottom of their imaginary problem. Dems can't sign up either, genius. Pray tell me "smith" o' brainy one. Just how does someone tell he is about to have a major illness? Will your heart attack send you a telegram, or maybe diabetes send you an email? Will all these illness' have only a couple of days in which to advise you in advance? Where in the name of God did some of you people go to school, or did you? Who cares what the GOP party of incompetent fools says, their probably to stupid to navigate the site, after all, they ARE the party of stupid with NO credibility on ANY issue, GOP morons!!!!! There has to be a better way to cover the uninsured , this Obamcare is not working and I don't want to lose my insurance next year when the employer's mandated coverage takes effect. Time hitch up them Government Mules and get this thing moving. Sometime's those mules balk. Just like "Dummy" Care. @ rs, think for yourself and not for the bammy media machine. You cannot believe at this point that bamman has a clue on anything, geeeez. @Scott: "Everybody will kick the bucket someday unless they get Obamacare quick, and for free." Ah, another uninformed post from a RWNJ. Guess it's easier than taking a good hard look at your party's failures and having the stones to admit you've been played for a fool. Just ask uncle Omar, I am sure he knows how to access government systems! maybe they will be smarter than the American public that re-elected those that passed this law and shut it down. What more do you politicians need to see? It is not ready, not what was promised, more expensive than estimated and still growing in cost. Make the right choice and show this president that has never had anyone question him let alone stand up to m that he is killing America and we need to pull this turkey out of the oven before it is too late.